As I approached the Royal Selangor Visitor Centre located in the light industrial suburb of Setapak, KL, I thought to myself how nice it would to be in a location with so much greenery all around. The building gave me a good first impression in that it had a pleasant look, had high ceilings, and was very airy and spacious. As I walked in, an elderly lady dressed elegantly in a bright red cheongsam wearing pretty beaded shoes caught my eye from a distance. Katherine, our event organiser, warmly greeted me and immediately introduced me to this lady, Datin Chen, who gave me the sweetest smile. It turns out that she is the director of the fine establishment and the granddaughter of the founder of this establishment. She was to be our gracious host. The roots of the business goes way back to 1885 when a young man by the name of Yong Koon came all the way from Shantou, China to seek better fortunes. It was tin that attracted him here. He brought with him pewter smith skills which he applied and improvised making beautiful high quality handcrafted items admired by many. Over the years, these skills were taught and passed down to both family and employees. The variety of items also grew exponentially over the years. The history of the country impacted the growth of the business. When the colonial masters were here, their demand for new items was introduced. Over time, customer preferences changed and the business changed accordingly enabling it to thrive despite two world wars and four generations. As with many other family businesses, there were indeed family feuds but the strong and sensible ones pulled through and persevered to make it the fine establishment it is today. 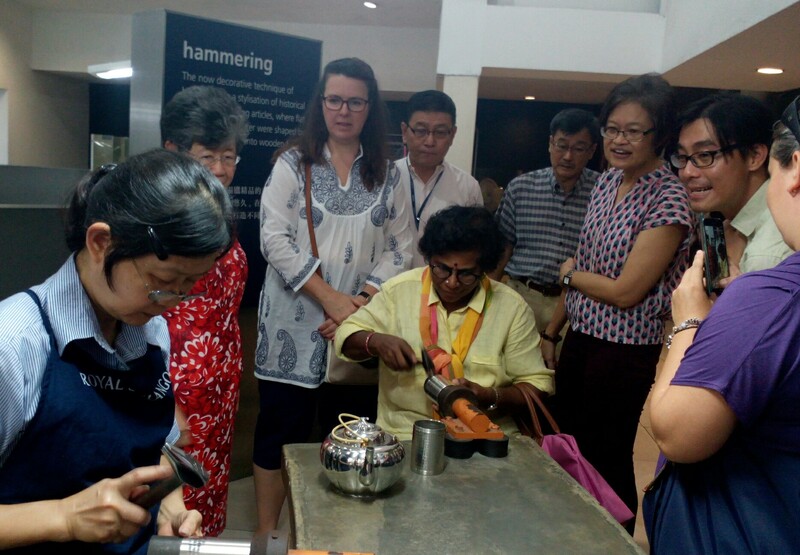 The colonial masters and foreign visitors were very impressed with the quality of the beautifully handcrafted items. Their purchases and good testimonials became a major factor in making it a global brand. It was precisely this that earned the business the right to use the word ‘Royal’ for its brand. The true story has it that during a visit to Perth Australia, the Sultan of Selangor then, the late father of the current Sultan of Selangor, was asked by a sales assistant from where he came. When he said Selangor, the sales assistant in turn asked ‘Selangor’ as in the brand ‘Selangor Pewter’? Yes, the Sultan replied. Of course, the Sultan was impressed that the brand was able to bring fame to his state and, so, he decreed that the business should include word ‘Royal’ in its brand name. With that, the brand value moved up higher. Royal Selangor is world famous now with retail outlets all over the world. It has built a very strong brand and has contributed much in making Malaysia known globally as well. Every single one of their products is handcrafted and one hundred percent made in Malaysia and this brings us back to our visit. Datin Chen started our tour by taking us up a ‘walkalator’ that led us up to the first floor of the building where a small museum is housed. She first showed a wall displaying hand imprints of all the staff that had worked there for at least 5 years. New imprints are added to the wall every five years. I thought what a pleasantly creative way to symbolize one’s loyalty. We could see on the walls also, enlarged old photographs of the founder, his family including his descendants, and his employees going about their business in the earlier days. Viewing these photos conjured up nostalgic emotions in me. They reminded me of my own family’s collection of old photos. Both my parents were born and bred in KL. There were also photographs that showed famous visitors including that of American actor, William Holden and Bill Clinton. 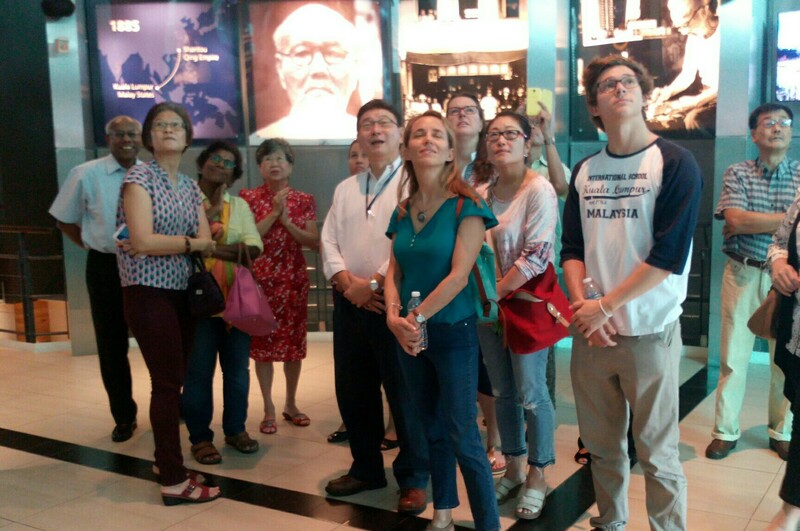 Other notable visitors included Martha Stewart, Christin Lagarde and of course, the late Sultan of Selangor. 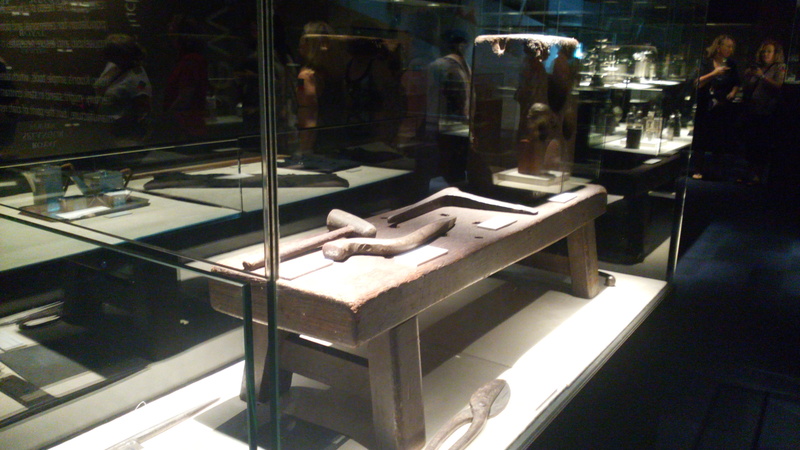 Next, we were introduced to exhibits of the old tools used in the early days. We also got to view items that were made in the earlier days such as incense burners, joss stick and candle holders plus other prayer items on Chinese altars plus everyday items such as teapots. 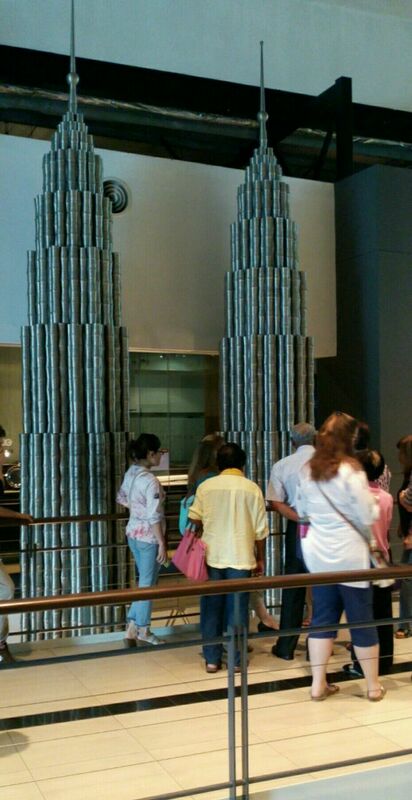 There is also a model of the Petronas Twin Towers constructed entirely with pewter beer mugs about one fiftieth of the actual height of the twin towers. 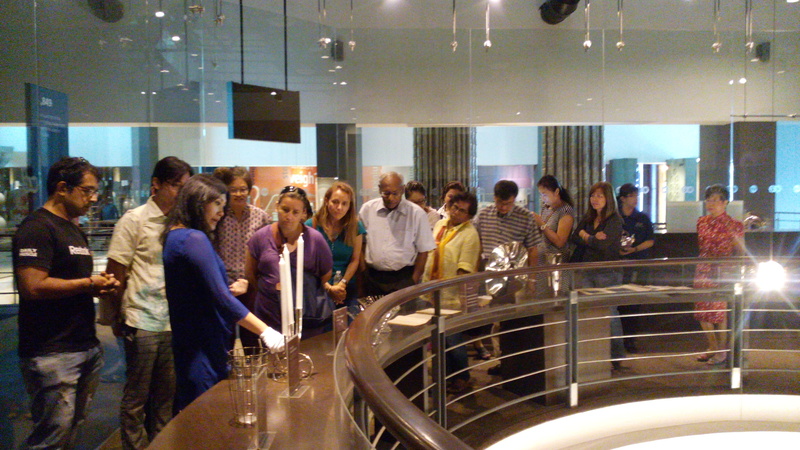 We were privileged to enter into a glass enclosed area at the museum which is not opened to the public. Datin Chen said only special guests were allowed in. This area exhibits some of the finest silver sterling made under the brand Comyns. 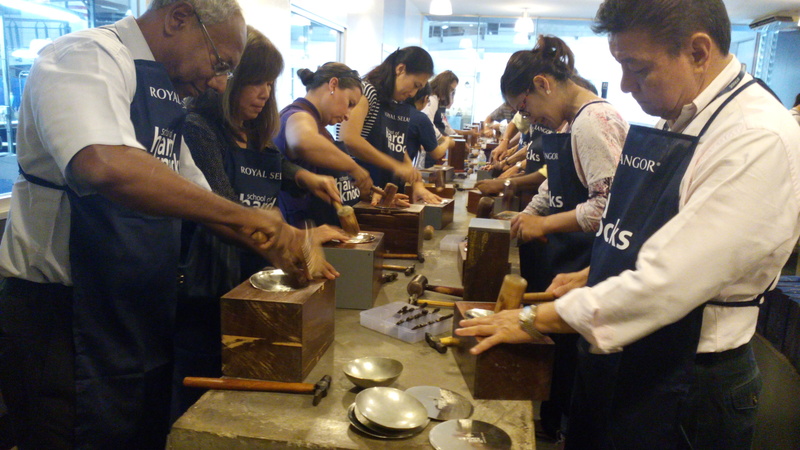 Royal Selangor acquired the London silver company Comyns in 1993. Along with this, came thousands of beautiful designs dating back to the 17th century. We were all awed by these lovely European designs. Just before we entered the place where all the action was, i.e. the factory, we were served cold refreshing isotonic drinks in small pewter mugs. Datin Chen explained pewter properties did a good job keeping cold drinks cold. And for hot drinks, pewter ware is very good at retaining the heat. Having been refreshed, we were then able to witness how some of the work was carried out in the factory. Processes in the factory included casting, filling, scotching, hammering, polishing, buffing, soldering etc, most of which had to be done by hand. Each worker specialised in a specific process. Datin Chen explained that many of the senior workers had been working with the establishment from their teenage years right up to retirement where many had become grandparents. Following this was the most exciting part of our tour. We entered an enclosed area called the School of Hard Knocks where we all got into action. 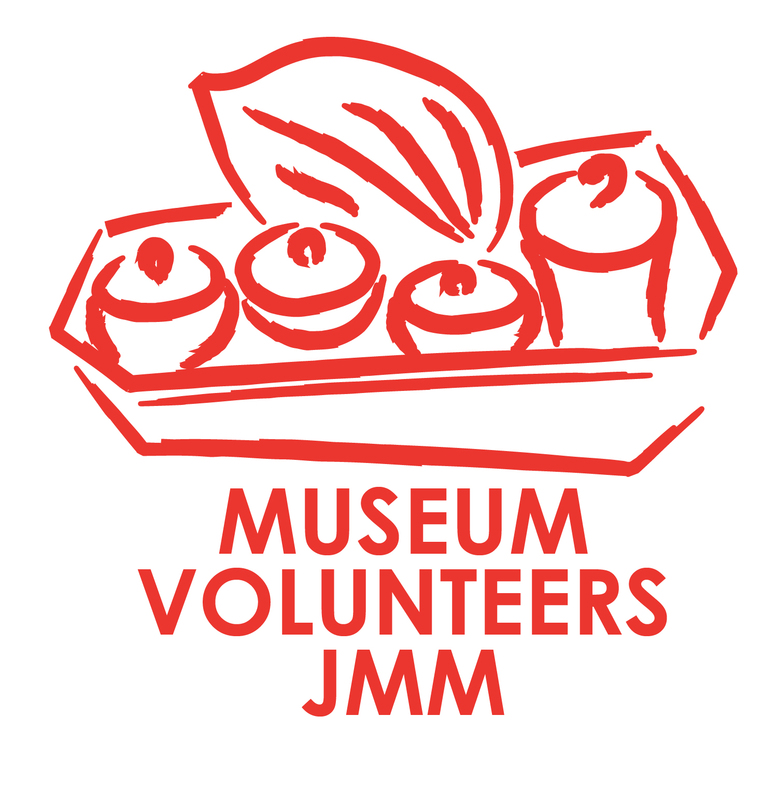 We were each given an apron, a pewter disc (much like a CD), a hammer and a wooden block which is actually the mould for the pewter bowls which we were to make ourselves. All the noise from the hammering then started. It was fun and exciting making our own bowls engraved with our initials. What a lovely souvenir to bring home. We got to keep the aprons with the words ‘School of Hard Knocks’ too! There is no way I can forget this exceptional experience. 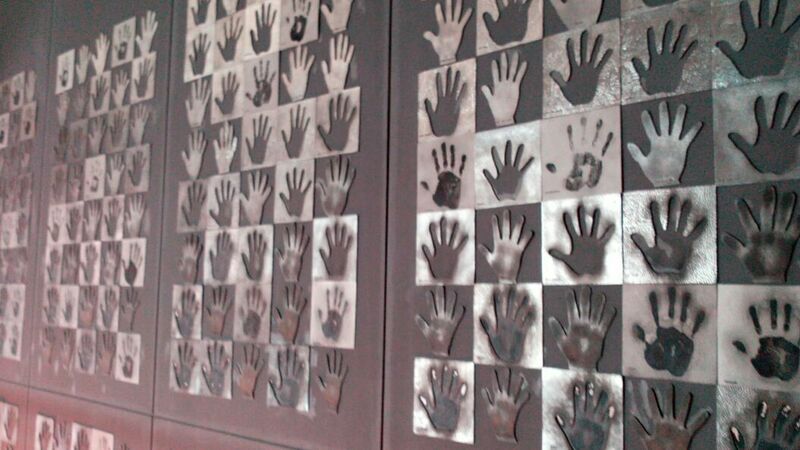 As we left, we were informed that visitors could also make their own hand accessories at the Foundry for a fee. Having used much of our energy knocking hard, we were then brought to the in-house café where we were served delicious refreshments with hot coffee and tea. This café is clean and comfortable. It has a lovely ambience surrounded by lots of greenery. Datin Chen continued to entertain us with interesting stories relating to the business as we ate and drank. I noted that by the time we finished, the coffee and tea which was served with pewter pots, was still very hot. 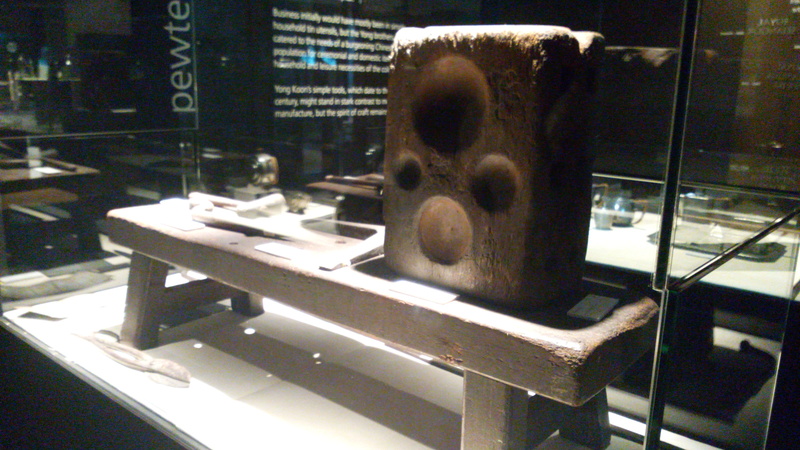 This is proof of what Datin Chen claimed earlier about pewter’s property on heat retention. 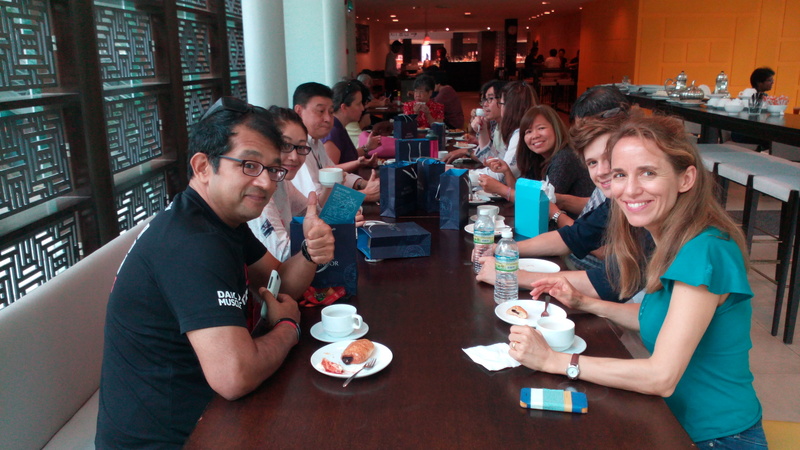 With contented tummies, we were then led to our final stage of the visit – retail therapy. There was a huge variety of items on display, all of them of good quality and beautifully crafted. Apart from pewter ware, there was silver sterling (under Comryns brand) plus fine jewellery (under Selberan brand). In 1972, Royal Selangor diversified into the manufacture of European jewellery when they started a joint venture business with a Swiss jeweller Eberhard and an Austrian gem setter, Angelmahr. The diversification into fine jewellery and silver sterling, Datin Chen explained, was the reason why the word pewter was dropped, making it just Royal Selangor today. Personally, I think pewter ware from here makes a perfect gift for foreigners as it is not only 100 percent handcrafted in Malaysia, but of good quality too. 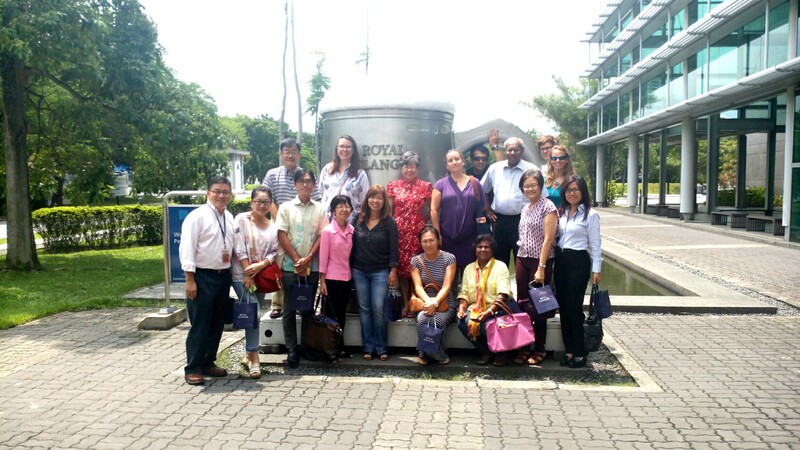 We ended our visit with a group photo with Datin Chen taken with the biggest pewter tankard on earth just outside the visitor centre. Just before we left, we conveyed our deep gratitude to Datin Chen for her courteousness, warmth and generosity (her time, souvenirs from School of Hard Knocks and the refreshments at the café). Now I know we have this gem in my very own backyard, a must visit for any foreign visitor. 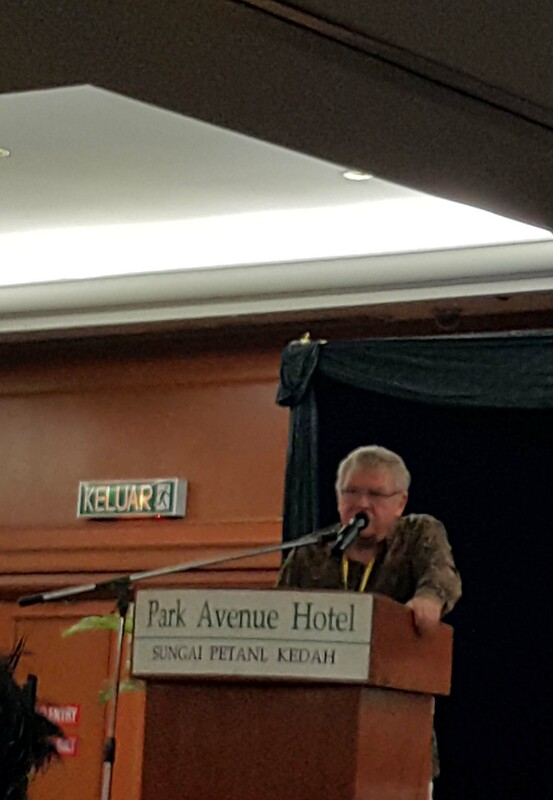 The Kedah Tua International Conference (KTIC) in Sungai Petani kick-started on 21 May 2016 with Dr Stephen Oppenheimer presenting the first keynote address. His presentation focused on using genetic phylogeography to trace the migration patterns in South East Asia. Two pieces of DNA are used to build a gene network: mitochondrial DNA (mtDNA) which is passed from mother to daughter and Y-chromosome (NRY) which is passed down the male line. As these two pieces of DNA do not recombine during reproduction, they are transmitted unchanged through the generations allowing scientists to trace human migrations through random mutations that occur in these DNA strands. 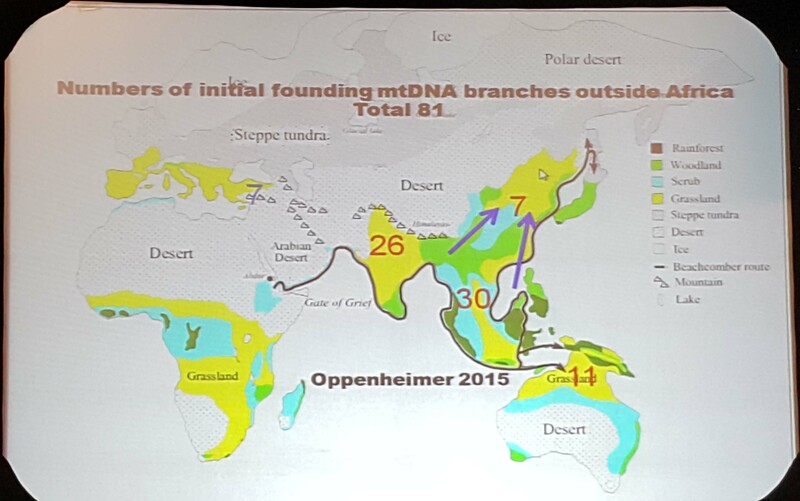 A large part of Dr Oppenheimer’s presentation centred on a recently published paper that used genetic methods to study the ancestry of inhabitants in island South East Asia (ISEA). For the past 30 years, the Out of Taiwan theory has held sway to explain these origins. This theory is based primarily on linguistic evidence; the antecedents of Austronesian languages spoken in ISEA can be traced to the aboriginal population of Taiwan. By extension, Southern China is theorised as their original homeland. The Austronesian speaking population is said to have arrived in Taiwan from Southern China around 6500 ya. From Taiwan, they moved into the Philippines around 5000 ya and reached southern Philippines by 4000 ya. From here, there was rapid dispersal to the rest of ISEA and Oceania with arrival in the Pacific by 3000 ya. A model that combines this Holocene colonisation with an earlier Pleistocene colonisation from Southern China via the mainland has successfully withstood attacks from detractors who favour a homeland from within the Sunda shelf. The Out of Sunda theory proposes that the inhabitants of ISEA originated from within ISEA itself and that it was the sinking of the Sunda platform which provided the impetus for dispersal. This turns things around and places insular South East Asians as ancestors of the aboriginal Taiwanese. Genetic evidence has been employed by scientists on both sides of the divide to support their views. The recent study conducted by a group of international scientists, of which Dr. Stephen Oppenheimer was a part, is the most comprehensive undertaken to date. It uses a combination of mtDNA, NRY, and published genome-wide data. The results are surprising in that while they mostly support the Out of Sunda theory, the study also detected minor migrations during the Late Holocene from Taiwan, corresponding to the Out of Taiwan time-frame. However, the study noted that these migrations did not have much influence on the ISEA gene pool and that the impact was mostly cultural and linguistic. The story of human migration starts around 85 000 ya in East Africa when a group of Homo sapiens (modern humans) crossed the Red Sea into the Arabian Peninsula and then travelled along its coastline into the Indian subcontinent. All humans outside Africa are descended from this single exit. These beach-combers continued around the Indian Ocean coast to arrive at Lenggong Valley in the Malayan Peninsula by at least 74 000 ya. They then traversed the edge of the Sunda platform before moving north into Indo China and Southern China as well as south into Australia. It should be noted that an earlier migration out of Africa arriving at the Levant around 125 000 ya failed to populate the world as the onset of an ice-age either killed the population or forced them back into Africa. The diagram above shows clusters of gene types (mtDNA). 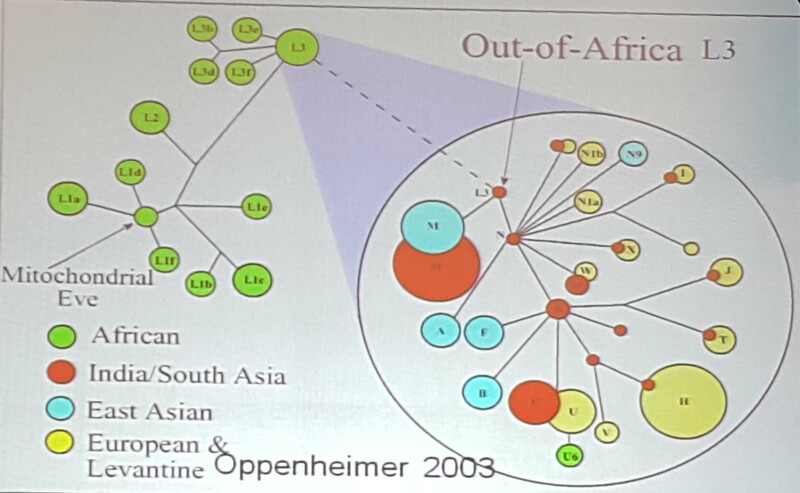 The green circles represent gene types in Africa and the large circle on the right shows gene types in the rest of the world. The single exit out of Africa is represented by the haplogroup L3 which gave rise to two important branches outside Africa. 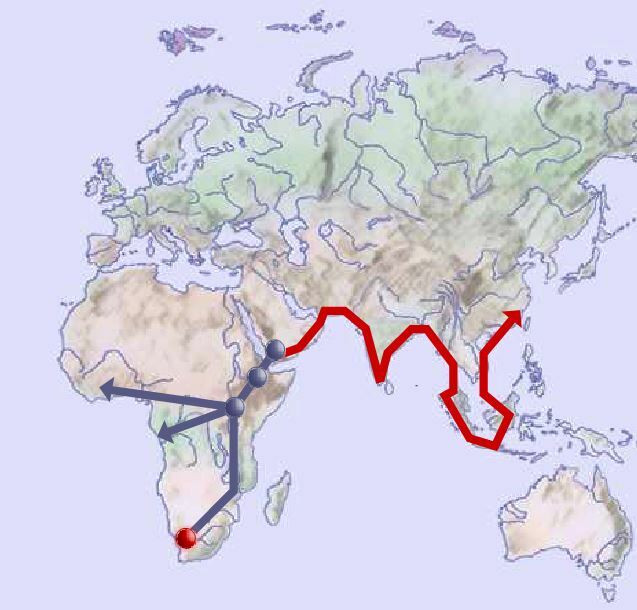 The M branch evolved in present day India and is found in all humans outside Africa except Europeans and Levantines. The N branch evolved around present day Pakistan/Iran and is found in all humans outside Africa including Europeans and Levantines. The M supergroup gave rise to M9 which evolved in SEA around 50 000 ya. M9, in turn, gave rise to the haplogroup E which developed in Sundaland around 23 000 ya. This haplotype is widely dispersed and some of its daughters can be found in Taiwan; 15% of all gene lines in ISEA and Taiwan belong to haplogroup E.
One of the main reasons behind the wide dispersal of haplogroup E was the sinking of the Sunda platform caused by three rapid rises in sea levels between 15 000 and 7000 ya. The effects of these sea level rises can be seen in the genetic record – genetic drift, equivalent to extinction, corresponds to the three distinct rises in sea levels. The extinctions were followed by a major expansion of haplogroup E which expanded throughout ISEA, as far north as Taiwan, and east of Guinea. As the land halved and the coastline doubled, the population adapted itself to maritime activities allowing them to carry their genes far and wide. The Austronesian migration can be seen through mtDNA haplotype M7c3c. It has a similar distribution as E but goes in the opposite direction. Coming from China into Taiwan, it spread from Taiwan into SEA around 4000 ya. This haplotype is present in around 8% of Indonesians. The diagram above shows that, along the route out of Africa, Sundaland has the highest number of founding branches, 30 in total, making it the most diverse place outside Africa. If we look at the indigenous populations of the Malayan Peninsula, 86% of their lineages come from locally founding Sunda lineages and 14% from East Asian lineages. For the Malay population, around 58% of their lineage is from local Sunda founding lineages, 38% from East Asia, and 4% from South Asia. 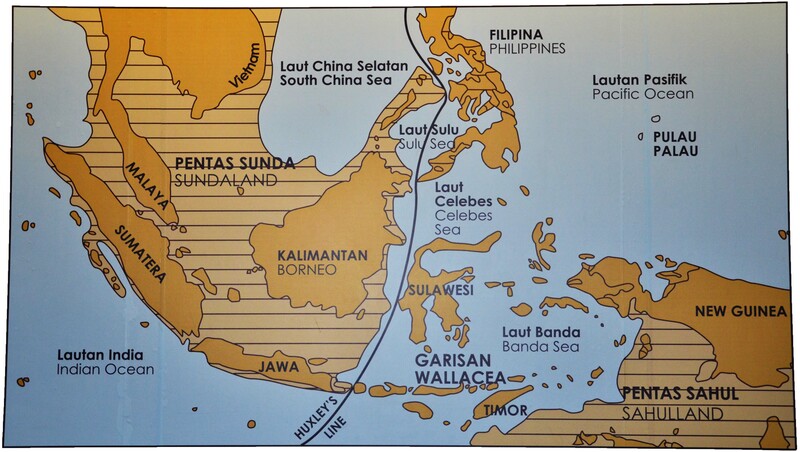 Of the local Sunda lineages, 33% of these lineages go back 60 000 – 25 000 ya. Of the East Asia lineages, only 7% are from Taiwan. The Malayan Peninsula not only facilitated movements from Indo China and East Asia to ISEA (the spread from Indo-China to ISEA associated with Hoabinhian culture is about 20 000 ya), it also facilitated movements from Africa to Indo China, East Asia, and Australia. 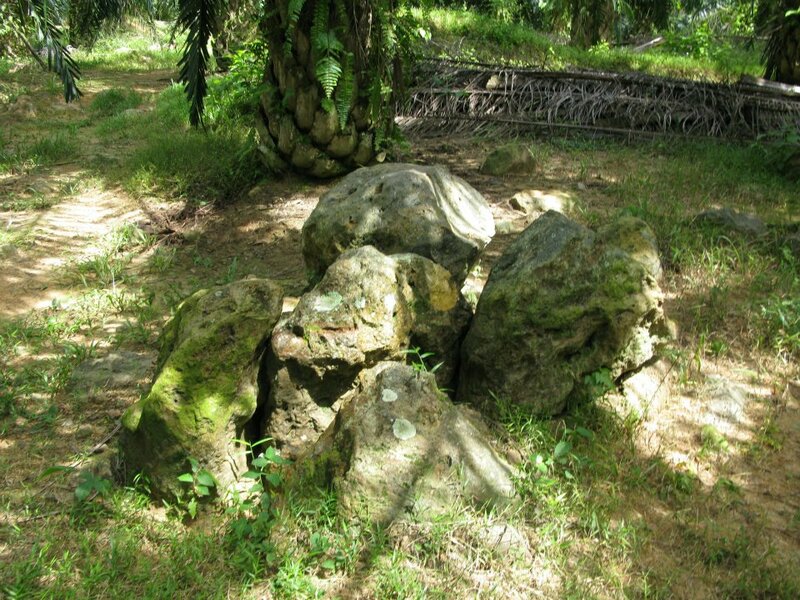 Archaeological evidence supports the assertion that Lenggong Valley was a key area on the migration path of humans. Kota Tampan in Lenggong Valley has yielded a stone tool making workshop covered in ash from the volcanic eruption that created Lake Toba in Sumatra. This ash dates to 74 000 ya attesting that modern humans must have arrived in Lenggong Valley before this eruption took place. The Lenggong Valley has also shown continuous settlement from 40 000 ya to present. The finding of a stone hand-axe dated to 1.83 million ya at Bukit Bunuh, about 1 km away from Kota Tampan, shows that Lenggong was also on the migration path for Homo erectus, an earlier species of the Homo genus. This hand-axe was found buried in suevite. Its discovery puts Lenggong Valley on the migration path of Homo erectus, whose best known representatives are the Java Man (700 000 years old) and Peking Man (500 000 – 300 000 years old).